There are many reasons why we should all juice. Today I will be talking about just 3 of those reasons. Many are surprised to discover greens are one of the best sources of instantly absorbable, alkaline protein. Amino acids are the building blocks of protein and green veggies are loaded with these muscle building nutrients. How do you think cows get their amino acids, magnesium, calcium and other muscle and bone building nutrients? FROM GREENS! They eat the green grass that contains all the phyto-nutrients we need to flourish. So, cut out the middle man and go straight to the source- EAT YOUR GREENS. I have read so many articles that say meat is the best source of protein out there, its so false. Yes they contain alot of Grams of protein but what your body absorbs is a completely different ball game. Your body will only absorb 20 percent of that protein. Raw Juice is also full of live enzymes. Food enzymes help make the digestion of food possible. All of natures uncooked and processed foods are full of enzymes. Its what gives us life and health. Live enzymes have a million and one functions, and there are many different kinds of live enzymes. Raw food and raw juice are living foods, they are life. But once you cook your food, they are gone. 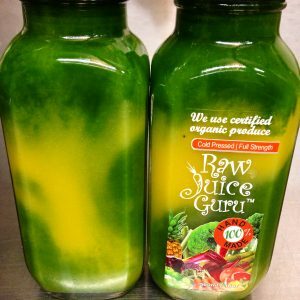 Enzymes are destroyed at temps over 115 F.
If you want Raw energy without the crash, raw juice is your answer. Coffee is not only acidic in your body but it is also one of the most heavily pesticide sprayed crops around. Raw juices are liquid nutrition that your body drinks up almost immediately. Enjoy the rich infusion of nutrients.